Do you love reading short stories? What about dark tales with a demonically-possessed X-Box, a skinwalker or a haunted forest? 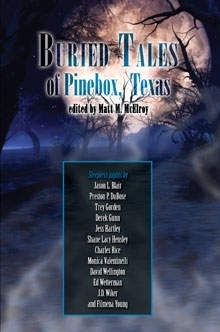 The e-book version of Buried Tales of Pinebox, Texas is available now at DriveThruHorror.com  and the paperback version is available through Amazon.com . overnight lows in the 40s drove students to their jackets and sweaters. Cal Griffis was the first one in. He usually was. It wasn’t that he was an early riser—he just didn’t sleep much. Nights were spent delving dungeons in the latest massively multiplayer online game, or scoring headshots in the “kewlest” next-gen shooter on his game console. He’d stay up until one or two in the morning on his games, then get up and moving again by 7 a.m. Cal was a video-game junkie, but that was an acceptable flaw in a computer science major. This morning he juggled a large coffee on top of his textbook while trying to jiggle open the stubborn lock to the computer lab with his other. Cal’s thick glasses started falling off as he did so, and the heavy bag on his shoulder that held his screamin’ laptop started to slip as well. Disaster struck. The laptop strap slid off the shoulders of his ill-fitting denim jacket, hitting the crook of his elbow with considerable force. The textbook in his hand up-ended and sent steaming hot mocha latte all over Cal and the lab door. A moment later, Cal’s glasses slid off his face and landed lenses-down in the mess. Cal said something his mother wouldn’t be proud of. Near blind and covered from crotch to toe in sticky coffee (Cal liked it sweet, so it was extra syrupy), he entered the lab. He couldn’t see, but he knew something was wrong. There was an acrid smell—even stronger than the latte—as if something electronic were overheating. He could barely make out a black blob slumped at one of the desks. Cal crossed to the restroom and grabbed a handful of paper towels, then headed back toward the scene of his disaster. “Dude. You fell asleep here again.” Cal stepped toward the coffee and heard a sickening crunch—his glasses. A string of expletives followed as Cal cleaned, but Freddie didn’t stir. He remained motionless five minutes later when Cal finally finished. The college junior went back into the bathroom and rinsed off his glasses. He put them on his face and sighed heavily as he saw twin cracks up both lenses. He could just make out his thin face, stubbly chin, moppy black hair, and piercing blue eyes beyond them. Freddie wasn’t okay. Cal shook him and gasped in horror as his cohort’s chair rolled backward and Freddie fell awkwardly on the tile floor. There was a disturbing crunch as his skull bounced and Cal elicited his second to last expletive of the morning. “Freddie!” Cal leaned over and grabbed his sometimes-friend to help him up—certain the fall would wake him—but recoiled quickly. Even through his shattered glasses he could tell Freddie was gone. His eye sockets were two charred holes and his lips were burned black with bright red bloodlines in the dark cracks. Cal issued his last expletive of the day and called the campus police. We found Frances Bucknell’s body down at the railroad siding on Sunday, but couldn’t make a positive ID until Tuesday when some kids found her head in a drainage ditch off Cane Bottom Road. In a town like this not even Sheriff Anderson tried holding the information back from the press—there was no point, since gossip moves faster around here than email. Needless to say by lunch time everybody in Pinebox had a pet theory as to how she died. Sheriff Anderson sat up straighter on his stool and swished his coffee around in his mouth like it was mouthwash. He did not respond. I shot Jane Blewer a look that she should have understood, a look that said now is not the time. Alicia Crowley was next to speak up, though, and she was not the sort to be put off by a meaningful look. “I’ve never heard of an alligator that would take a girl’s head off and carry it four miles into town,” she added. The ladies were after something. Did they know I already had a good idea who the killer was? God, I hoped not. “Gators do funny things, sometimes,” I said, trying to defuse the situation. The sheriff sighed deeply—he wasn’t enjoying this game. He picked up his sandwich but didn’t bite into it, just stared at it for a while. I suppose he knew what was going to have to come next. “At least tell us if there are any leads,” Tiffany Bishop pleaded, pulling her friend back down into her seat. “Well now, I wouldn’t know,” the Sheriff told her. He looked about ready to pop an artery. I wiped my mouth with my napkin, knowing how this would end. “It sure was, but then the head was found here in town,” the sheriff said, with a nasty smile. “Which makes it a matter for the Pinebox Police Department. Come on, Clark.” He threw some money on the counter and stormed out into the East Texas sun. I hurried to follow. “Thanks,” I said, and started to turn away. “An unpaid personal day,” he added. I just nodded and hurried off to where I’d parked my patrol vehicle. Mom said Mrs. Jones was just a sweet old lady, but all of us kids knew better. Especially after what she did to my friends. Of course, no one believed us. We were just kids, and adults are too busy with business and bills to listen to kids. Well, except for old Leonard. He believed us, but no one believed him. Mrs. Jones had lived forever in the old A-frame ranch house near the railroad tracks. It was yellow with dingy white trim, and the paint peeled so badly that it almost looked like some animal with long, sharp claws had decided to use it as a scratching post. And cats. She had lots of cats. The place reeked of cat piss and that old, musky smell of someone who had lived too long. Just before the Fall Festival, we were riding our bikes down the hill on Linda Lane. The last house at the bottom of the cul de sac was Mrs. Jones’s, and her circle concrete driveway was exactly at the bottom of the hill. The Three Amigos, that’s Tommy, Jimmy, and me, would cruise down the hill just as fast as we could, racing the wind and each other. At the bottom we would have to hit our brakes just as we left the pavement for the concrete of her driveway. Of course this left bike marks, but we didn’t think anything of it at the time. Then we would lean our bikes and whip around the circle as fast as we could to build up speed for the ride back to the top of the hill. Tommy was my best friend. We did everything together. We even shared the same birthday, April 11th, and we both turned twelve years old that year. We played in little league on the Giants, attended the same class in Pinebox Middle School, and his parents took me on a vacation with them the previous summer to Little Rock, Arkansas. We went to a diamond mine and dug for two hours. We found a small one. Tommy and I decided we would be co-owners of it forever. Every week we would pass it back and forth between us. I keep it on my dresser now, right next to the frog aquarium. I can’t bear to touch it anymore. I just can’t. On our seventh race down, it was Jimmy Berry in the lead, followed by Tommy and me. I usually was last. My bike wasn’t a racer like theirs, but mine was the best trick bike. As we hit the small bump leading from the pavement to the concrete of her drive, old Mrs. Jones herself appeared in the doorway. Her wrinkled old face looked like an angry Halloween mask, but I couldn’t hear what she was saying over the loud hum of bike tires over asphalt. She held something in her left hand and at first I thought she was just waving a stick at us like crazy old people do. One second we were riding the wind, and the next Jimmy’s front brakes locked up. Right in front of us, he flipped over the handlebars and swam through the air like a rag doll. When he hit the old lady’s concrete driveway, his head sounded like a watermelon thrown at the ground. Tommy and I laid long, black skid marks while our friend’s body scraped forward, rolling and tumbling. No, he wasn’t wearing a bike helmet. How his mother screamed when she got to the scene. The police had covered his body beneath some kind of dark blanket. What I remember the most is the blood. It seeped onto the concrete drive and slowly spread onto the grass. This preview for was provided and published with express permission from 12 to Midnight. ©Copyright 2009. All rights reserved.